State officials say Connecticut’s high vaccination rate makes a widespread measles outbreak unlikely. Health officials have confirmed a third case of the measles in Connecticut this year. An adult from New Haven County was exposed to the disease last month during a visit to Brooklyn, N.Y., the state Department of Public Health said Friday. It is not linked to the two previously verified cases that were reported in January. The person has been isolated, health officials said. Measles cases are considered infectious from four days before the onset of a rash to four days after. In the latest case, the rash onset occurred on Thursday. Connecticut reported three cases of measles to the CDC in 2018. The state’s vaccination rate has traditionally been high. In the 2017-18 school year, the most recent data available, more than 96 percent of the state’s kindergarteners were vaccinated against polio, diphtheria, measles, mumps, rubella, Hepatitis A and B and varicella. 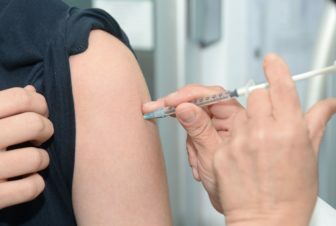 Between 95 percent and 98.5 percent of seventh graders were immunized against those conditions and meningococcal disease. Most of the recent measles outbreaks in the United States were the result of a traveler bringing the disease home with them from overseas. The virus then spread through the unvaccinated people in the travelers’ communities. Officials in Rockland County, New York, declared a state of emergency last month in connection with a measles outbreak. As of Thursday, the county reported 180 confirmed cases of the disease. The outbreak has been largely concentrated in ultra-Orthodox Jewish communities in Rockland, where vaccination rates tend to be lower and anti-vaccination literature has circulated, officials have said. The resurgence of measles in the United States is spurring a backlash against vaccine critics, from congressional hearings investigating the spread of vaccine misinformation to state measures that would make it harder for parents to opt out of immunizing their children. Coleman-Mitchell said that due to Connecticut’s high vaccination rate, the state is “at low risk” for a widespread measles outbreak.